The supposed 'Sandy Island' as seen on Google Earth. In a reversal of the centuries-old tradition of explorers undertaking ocean voyages of discovery with the hope of finding new land, a scientific party has done the complete opposite. A team of Australian and international scientists led by the University of Sydney has solved a mystery regarding the existence of a supposed island in the Southwest Pacific. The detective work took place on the RV Southern Surveyor, Australia's Marine National Facility research vessel during a research voyage aimed at understanding the tectonic evolution of the eastern Coral Sea. "We became suspicious when the navigation charts used by the ship showed a depth of 1400 metres in an area where our scientific maps and Google Earth showed the existence of a large island," said chief scientist Dr Maria Seton from the School of Geosciences at the University of Sydney. The maps that the scientists were using are based on a combination of the CIA World Data Bank and the World Vector Shoreline Database. 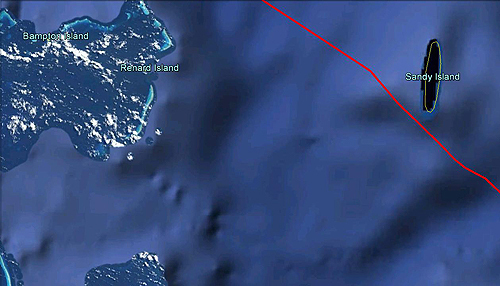 Even Google Earth shows a black blob in the area of the mythical island. The rogue island has regularly appeared in scientific publications since at least the year 2000. "So we decided to solve this modern day mythical island mystery. We found the navigational charts were accurate and there was no island in the area, so global maps including Google Earth need to be corrected." As well as mythbusting the existence of islands, the team have been collecting submarine data and rock samples from a little-explored part of the eastern Coral Sea. After 25 days at sea, they have collected 197 different rock samples, collected over 6800 kilometres of marine geophysical data and mapped over 14,000 square kilometres of the ocean floor. Not only did they uncover rocks formed around 100 million years ago as Australia, Antarctica and New Zealand broke apart, but they also found extensive limestone samples at 3000 metres below the waves, revealing a massive drowning of the region over time.